Hi my name is Cookie James, I am 2 years old. 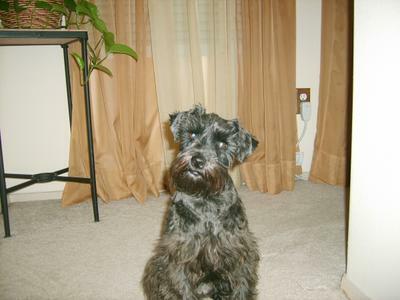 I live with Mommy, Daddy and my big brother Tug, he is a Schnauzer too. He is my best friend now, he is 9 years old, when I first came to the family I got on his nerves a little. I like to play, a lot, he likes to sleep, a lot! I use to live with my doggie Mommy, Daddy and brothers and sisters, I loved them too. I love to snuggle and give kisses, my favorite thing to do is to jump into my Daddy's lap while he is watch TV. I also love to kiss his face when he is trying to take a nap on the couch! I am a dedicated vermin chaser also, if it enters my yard I am after it! I love to go to doggie daycare, where I get to play with all my friends and run and wallow in the wood chips they put on the ground, my Mommy, however doesn't enjoy that as much as I do! My Mommy just bought me a new toy and I love it, even though they took all the stuffing out so I can't eat it. I am the official stuffed toy terminator! I have yet to meet a toy or ball that I cannot destroy in one day! My Mommy is the best, she makes me and my big brother Tug homemade Liver treats in the oven. It makes the whole house smell like Liver, Yum!